National Curriculum and Textbook Board (NCTB) uploaded the text books for class Seven - 7 - VII . Download these all PDF books from the following links. 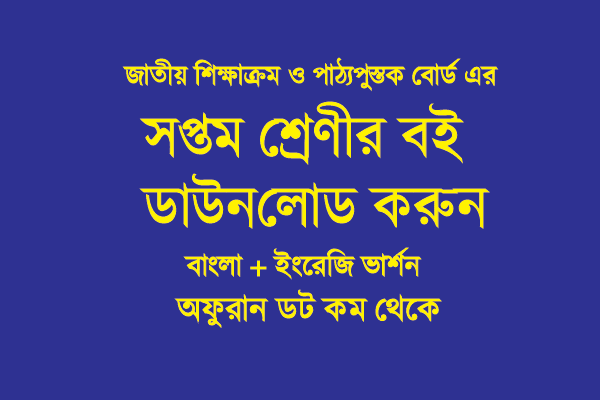 Class 7 - Seven - VII Bangla and English Version all PDF books are now available in the internet. Please download and keep in your mobile library collections. A Portable Document Format (PDF) book is very suitable for reading here and there. You may also print these PDF books for hardcopy and use that hard copy too for reading or practicing. Soft copy is very necessary for its unique advantages. We prefer reading hard copy but soft copy is also urgent. Small andethnic language and culture .